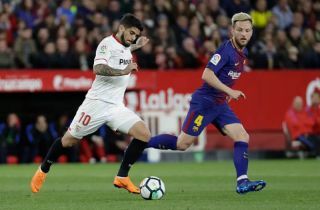 Arsenal have reportedly held positive talks over the transfer of Sevilla midfielder Ever Banega after a meeting between the club and the player’s agent. Talks are said to have been held this week, with things seeming to go well in terms of convincing the Argentina international to make the move to the Emirates Stadium. That’s according to Gazzetta dello Sport journalist Nicolo Schira, who now states all that remains is for Arsenal to come to an agreement with Sevilla over a transfer. This positive development follows the previous suggestion that Banega himself had some doubts over joining the Gunners due to a possible lack of regular playing time and question marks over the team’s playing style, according to La Colina de Nervion, as translated by the Metro. Still, it’s looking good for Arsenal in terms of bringing in a top class midfield player with plenty of experience, which looks necessary after the departure of Jack Wilshere, while players like Granit Xhaka and Mohamed Elneny have largely failed to impress. Banega played under new Arsenal boss Unai Emery at Sevilla and seems ideal to provide the north London giants with an upgrade in the middle of the park for next season.